Alex is a Signwriter and calligraphy tutor specialising in broad nib calligraphy. His Passion for hand lettering began while studying typography during a BA course in Graphic Design. Realising the beauty of the written word while wanting to branch out from the heavily digital world of graphic design, Alex attended calligraphy classes; a journey that allowed him to understand calligraphy and the methods of teaching. 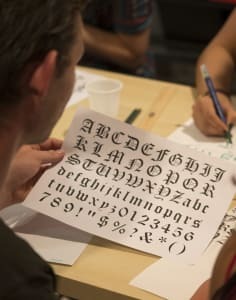 Alex First had the opportunity to lead a workshop at the London Graphic Centre in Covent Garden and since then has been learning, teaching and working with calligraphy and hand lettering.